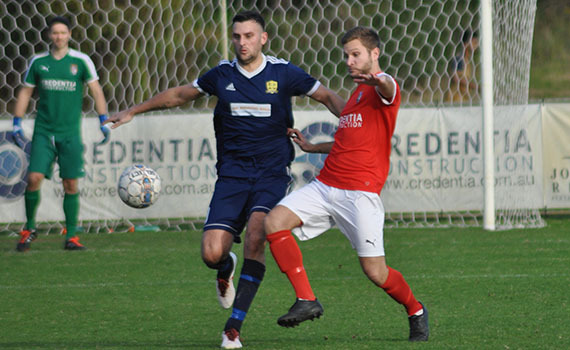 ECU Joondalup have won their first ever ‘Joondalup Derby’ on home soil, after beating their near neighbours Joondalup United 5-0 at the ECU Football Stadium. First half goals from former United midfielder Josh Whitmore, defender Shane Cassidy and Daryl Nicol put the Jacks in control, before Tom Hough’s deflected shot and Ethan Brooks fine finish wrapped up the points after the break. 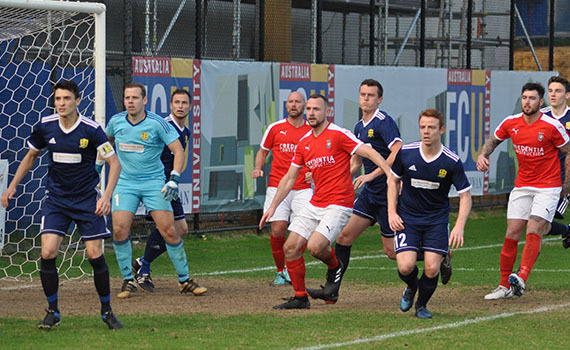 McCulloch was forced into three changes to the side that drew 3-3 with Armadale last week, with Gordon smith and Adam Tong out suspended, and Lukas De Lima injured, he brought in Whitmore to the middle of the park, while Brad McDonald came in at the back while Cameron Murray started out wide. With relegation confirmed for the visitors last week, they went into this one looking for some pride, but they found themselves behind after only five minutes. Steven McGarry’s cross from the bye-line was turned home by Whitmore at the near post. Despite conceding United looked lively going forward and Lee Jones was sent clear by a Matthew Cherrie through ball, but Jacks keeper Johnny Perkins was out smartly to clear the danger. But we looked dangerous going forward, and James Bosdet had to be alert, to save Ross Millard’s shot, before Cameron Murray’s solo effort was deflected wide. Murray was a constant threat and his link up play and drive had United on the back foot. The Jacks were now on the front foot and our pressure was rewarded just after the half hour with a second. Nicol’s run and cross went after the face of goal and Cassidy was on hand to score from close-range at the back post. It was 3-0 just before half time, Murray found Nicol on the edge of the box, and he eased past his marker before finishing powerfully. It was more of the same after the break and the Jacks looked sharp after the break, and Bosdet was again called into action saving well from Nicol’s in-swinging corner, before Hough’s follow up shot was straight at the United custodian. But there was nothing Bosdet could do when we added a fourth on 54 minutes. Murray raced down the left and pulled the ball back to Hough, whose shot took a deflection off Liam Mooney wrong footing Bosdet. It looked how many the Jacks would score, as Nicol was again thwarted by Bosdet before his shot on the turn flashed wide of the target. But we did make it 5-0 just after the hour, substitute Brooks was sent down the right and he finished well from the angle. 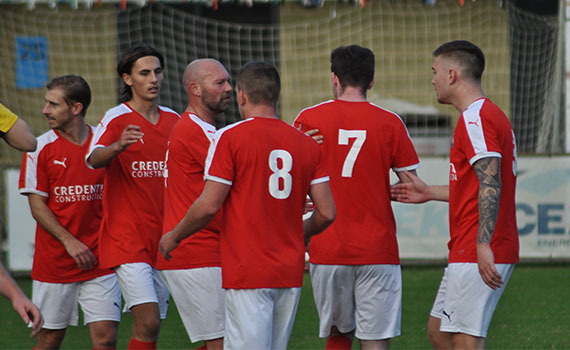 In other games on the day the under 18’s were held to a 1-1 draw ay United, while the under 20’s consolidated their lead at the top of the table with a 14-0 win. There was a hat-trick from Callum Speed, who was playing his last game for the club before moving to take up a college scholarship in the America. Other scorers on the day were Liam Murray 3, Paddy Doyle 3 (including a stunning bicycle kick), Ben Hinshelwood 2, Ronald Rixer 2, and Dylan Leonard.